Tom Izzo’s opinion that he needed a second NCAA title to “validate” his career sparked myriad responses. Mostly, the Michigan State basketball coach's innermost thoughts were met with rebuttals he has already proven himself. Let me tell you a story from the Heart of Tobacco Road, where I live, that illustrates that common belief. A couple of years ago I was talking college basketball with H. Trent Evans, the honored principal at Reedy Creek Middle School that my daughter attends in Cary, N.C. It’s a suburban town in the middle of Triangle connecting Chapel Hill, home to North Carolina and coach Roy Williams; Durham, Mike Krzyzewski at Duke; and Raleigh, home to N.C. State, a school with NCAA titles in 1974 and 1983 that is in another rebuilding phase under Kevin Keatts. When Evans learned I was a Michigan State grad, his eyes lit up. He launched into a story about attending teacher recruiting job fair on Michigan State’s campus. The booths were spread around the concourse of the Breslin Center. Yes, the story is anecdotal, but qualifies as common respect in Atlantic Coast Conference country. It’s Coach K-ian at Cameron Indoor Stadium or Ol’ Roy-ian at the Dean E. Smith Center. If anything, Izzo’s respect is up these days in the Triangle after the Spartans beat Duke on March 31 to advance to Izzo’s eighth Final Four. Two-thirds of the Triangle fans – North Carolina and N.C. State partisans – greeted me, dressed in Michigan State attire, with fist pumps or bumps. They were happy to see their rival taken down. Even a segment of Duke fans dismissed attaching Izzo’s reputation to his now 2-11 record against Blue Devils coach Mike Krzyzewski. They recognize Duke has been the higher ranked team in those meetings and Izzo’s one national title is backed up by his eight Final Fours and 14 Sweet Sixteens in 24 seasons. Izzo made his comments to the media on Thursday upon arriving for Final Four in Minneapolis. By that afternoon I was listening to WRAL’s Adam and Joe (Adam Gold and Joe Ovies), a popular Triangle sports talk show, discuss with Izzo’s self-evaluation. They consider him a great coach. They acknowledged, if Izzo wants to view it that way, he needs a second national title to join the pantheon of the late John Wooden (10 titles at UCLA), Krzyzewski (five) and Williams (three) and a handful of others you might list, but they didn’t discount his career. Jay Bilas, who played for Coach K at Duke, has long profusely praised Izzo as a coach while analyzing college basketball for now for ESPN and formerly with CBS. After Wooden and Krzyzewski is Kentucky’s Adolph Rupp with four titles. People don’t celebrate Rupp’s career that is stained by how he clung to segregation into the 1970s. Next with three are Williams, Indiana’s Bob Knight and Connecticut’s Jim Calhoun. Knight’s career was tainted by his abuse of players that led to his dismissal in 2000. Izzo drew criticism for harshly yelling at freshman Aaron Henry in the first round of the NCAA tournament, but he is no Bobby Knight. Knight was a bully that doesn’t suffer criticism from others. Izzo listens and accepts when he is wrong. He has that give-and-take relationship with his players. The 64-year-old Izzo has passed Knight in Final Fours (8 to 5) and his 606 career Big Ten victories in 24 years is within range of Knight's Big Ten record of 661 in 29. There have been 49 Big Ten coaches that have come and gone during Izzo's career. Calhoun, now retired, has three titles, but his named isn’t exulted nationally that much more than Izzo. The club Izzo wants to join with two NCAA titles lists North Carolina’s Dean Smith, Louisville’s Denny Crum, Florida’s Billy Donovan, Oklahoma State’s Hank Iba, Cincinnati’s Ed Jucker, Indiana’s Branch McCracken, San Francisco’s Phil Woolpert and Villanova’s Jay Wright. Rick Pitino technically is on the list with two, but his second title at Louisville in 2013 (his first was at Kentucky, 1996) was vacated by the NCAA for recruiting scandals. Whose career does one point to when citing the ideals of coaching student-athletes – Izzo or Pitino? Billy Donovan won two titles at Florida (2006 and 2007) after he lost in the championship game to the Spartans and Izzo in 2000, but he left for the NBA. He doesn't have the college legacy Izzo continues to build upon. Any Michigan State fan that complains about Izzo should consider where the program might be now if he had taken the Atlanta Hawks job in 2001 or the Cleveland Cavaliers position in 2010. Izzo's 24 years at one school also enhances his reputation. 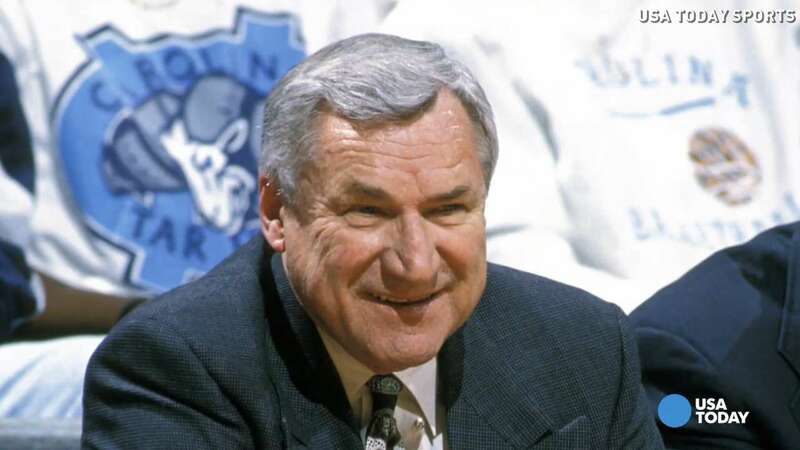 With the exception of the late Dean Smith, none of those two-title coaches overshadows Izzo. He is largely viewed as on par or better in a pickup game of selecting coaches based on his eight Final Fours. Smith’s reputation is sacred among college coaches, but he was questioned for many years as an overrated coach. It wasn’t until 1982, in his seventh Final Four and 21st season, that he won his first NCAA title. His second title in 1993 was in his ninth of 11 Final Fours and 36th season. Both those titles were won with a great bit of luck from bonehead player mistakes. In 1982, North Carolina led Georgetown 63-62 with 17 seconds to play when Georgetown’s Fred Brown brought the ball up court for a final shot to win the game. He thought he saw a teammate open when he threw the ball directly to North Carolina’s James Worthy to end the game. In 1993, North Carolina was leading Michigan 73-71 with 20 seconds remaining when Chris Webber pulled down a rebound from a missed free throw. He brought the ball up court for a game-tying basket or game-winning three-pointer. But he inexplicably called a timeout that the Wolverines didn’t have. A technical foul was called and the Tar Heels won 77-71. I bring that up not to diminish Smith’s two titles but to point out it takes some luck to win the whole thing. Without two bonehead plays, Smith may not have won a single title let alone two. Intangibles affect how a coach is viewed. Smith always has been celebrated at a greater level than two titles for reasons such as leading the integration of the ACC. As I've written in the pat, Smith deserved the Presidential Medal of Freedom he received in 2013, but Michigan State football coach Duffy Daugherty's two national titles and Underground Railroad teams are equal to if not superior to Smith's record. Why Smith and not Daugherty? It's tough to explain. Some images can't be manipulated or changed. Although Alabama coach Bear Bryant dragged his feet on integration, revisionist history gives him more credit than Daugherty for the integration of college football, even though that's an egregiously false interpretation. Images just happen. It's tough to explain. John Calipari, who has only one NCAA title in six Final Fours at Massachusetts (one, vacated), Memphis (one, vacated) and Kentucky (four), was on an ESPN Final Four pre-game show. He talked about the luck involved, mentioning sometimes a guy gets inexplicably hot and you can’t stop him. That foretold Michigan State’s loss a few hours later on Saturday to Texas Tech. Matt Mooney, a relatively unknown graduate transfer via Air Force and South Dakota, hit 8-of-16 field goals with 4-of-8 from three-point range to score 22 points. He averages 11.3. Otherwise, Texas Tech doesn’t have enough offense to beat the Spartans, who were without injured Josh Langford and Kyle Ahrens and Nick Ward at less-than-100-percent. Izzo already has his national validation, whether he feels that way or not.